Pantograph is an apparatus which mounted on the roof of electric train to collect power through with an overhead tension wire. It lift or down on the basis of the wire tension. Typically a single wire is used with the return current running through the track. It is a common type of current collector. Typically, a single wire is used, with the return current running through the track. The electric transmission system for modern electric rail systems consists of an upper, weight-carrying wire (known as a catenary) from which is suspended a contact wire. The pantograph is spring-loaded and pushes a contact shoe up against the underside of the contact wire to draw the electricity needed to run the train. The steel rails of the tracks act as the electrical return. As the train moves, the contact shoe slides along the wire and can set up acoustical standing waves in the wires which break the contact and degrade current collection. This means that on some systems adjacent pantographs are not permitted. Pantographs with overhead wires are now the dominant form of current collection for modern electric trains because, although more fragile than a third-rail system, they allow the use of higher voltages. 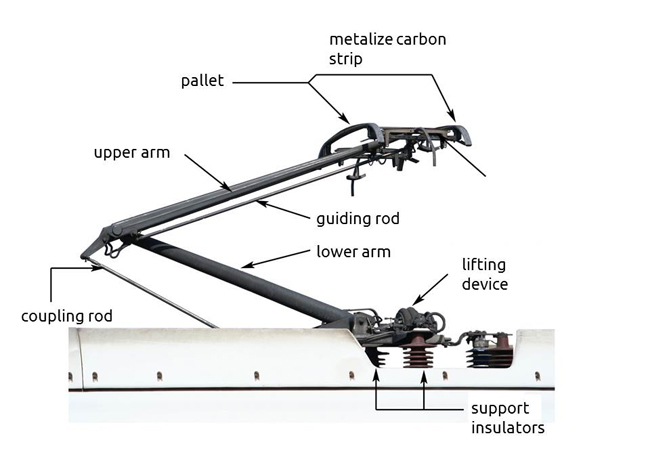 Pantographs are typically operated by compressed air from the vehicle’s braking system, either to raise the unit and hold it against the conductor or, when springs are used to effect the extension, to lower it. As a precaution against loss of pressure in the second case, the arm is held in the down position by a catch. For high-voltage systems, the same air supply is used to “blow out” the electric arc when roof-mounted circuit breakers are used. Pantographs may have either a single or a double arm. Double-arm pantographs are usually heavier, requiring more power to raise and lower, but may also be more fault-tolerant.